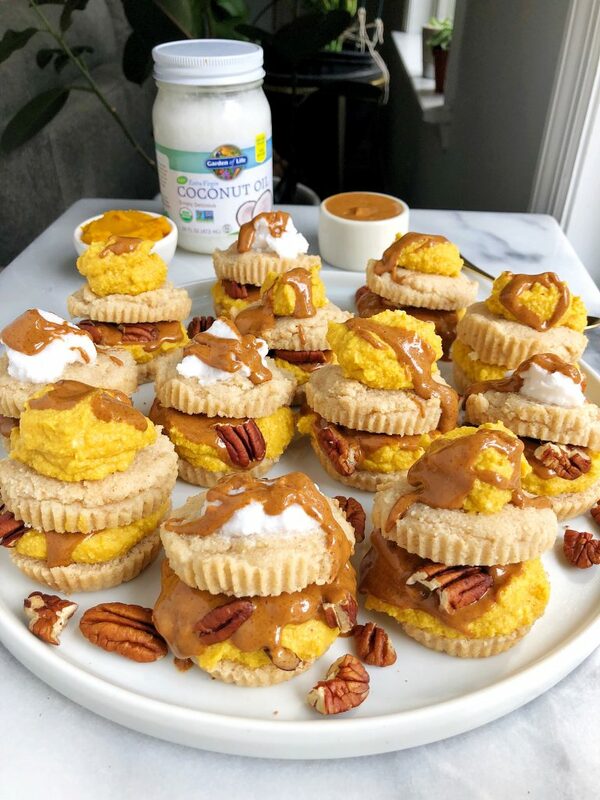 Paleo Pumpkin Mousse Shortcakes made with vegan and gluten-free ingredients for a delicious and naturally sweetened pumpkin recipe! 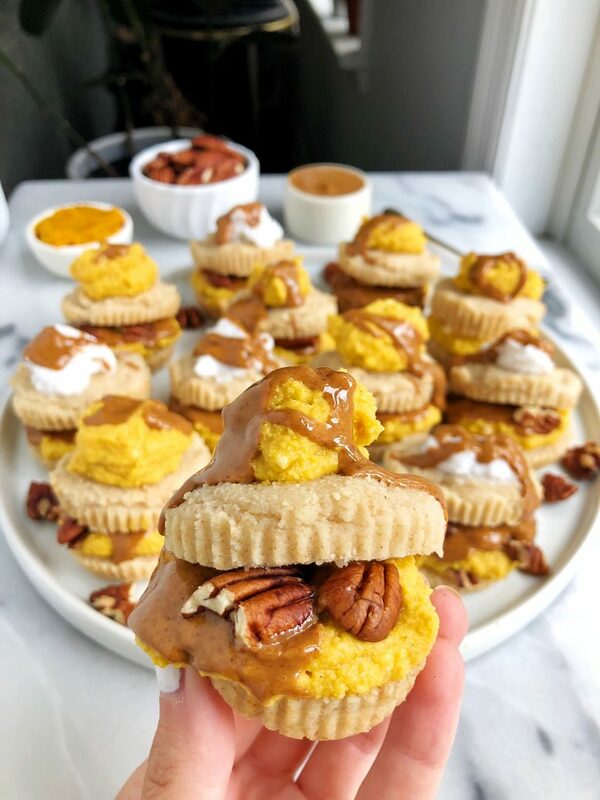 Paleo Pumpkin Mousse Shortcakes, say whhhhattttt?! Pumpkin season is here. And for the sake of not sounding like a basic girl who wants everything pumpkin, just hear me out. These mini shortcakes are insane. I actually made them on accident as I was trying to make pumpkin cinnamon rolls of sorts but no such luck. I refuse to waste ingredients so instead of tossing the dough as it wouldn’t roll. I decided to see what else I can do with it. These Paleo Pumpkin Mousse Shortcakes were the best accident in the kitchen ever. The dough is the perfect slightly sweetened shortcake cookie that is soft on the inside, almost biscuit-like then filled with a refined sugar-free pumpkin mousse. For the shortbreads you’ll need a non-dairy milk (any variety), almond flour, coconut flour, tapioca flour, coconut sugar and my beloved Garden of Life Extra Virgin Organic Coconut Oil. My number one baking companion over here. It is a complete staple in my pantry and it is so easy to melt to bake with when needed. Pop it in the microwave or heat on the stove then let it cool before adding to whatever you’re baking. You guys know that Garden of Life is truly such a special brand to me. We’ve been partnering for over a year now, which seems surreal since they have been a brand that I have been using since before blogging. Their vitamins, supplements and food products are all organic, sourced responsibly and I love love love them as a brand. The events we hosted together in Florida and Chicago this year were my favorites yet and I cannot wait to plan some more soon for you guys! Plus their vitamins have been a staple in my pregnancy too! 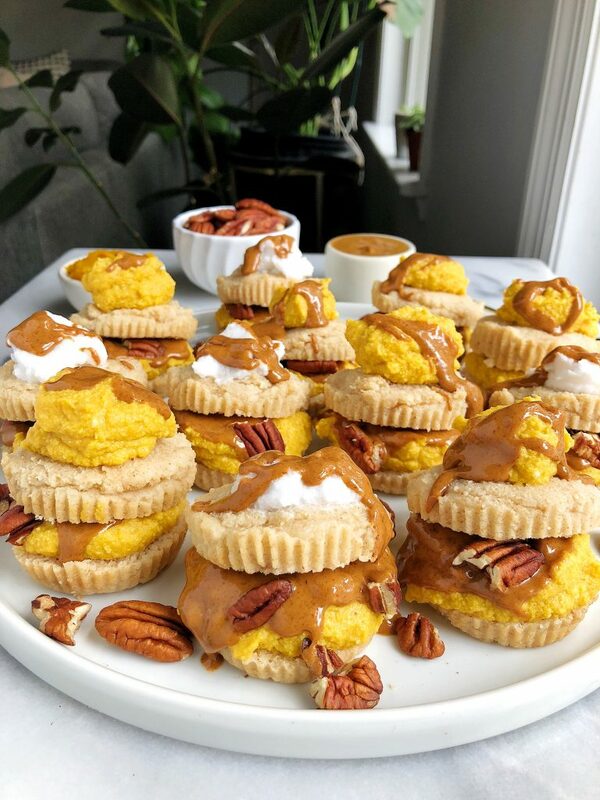 Okay okay but back to these Paleo Pumpkin Mousse Shortcakes. Make them, bake them, love them. They’re perfect to whip up for the holidays or whenever you are craving them! Don’t forget to tag me on Instagram when you make them. Here are also a few of my other favorite recipes on the blog using Garden of Life products: Fluffy Vegan Pancakes, Crunchy Pumpkin Pie Granola, Chocolate Crumb Banana Bread Bars and those 6-ingredient Vegan Chocolate Scones. Top with other half of shortcake and enjoy! Thank you Garden of Life for sponsoring this post! It means so much to me to work with brands I love and believe in on the blog!